CW3E long-time collaborator, Mike Dettinger, and USGS colleague, recently published a paper in Geophysical Research Letter titled: Flood runoff in relation to water vapor transport by atmospheric rivers over the western United States. 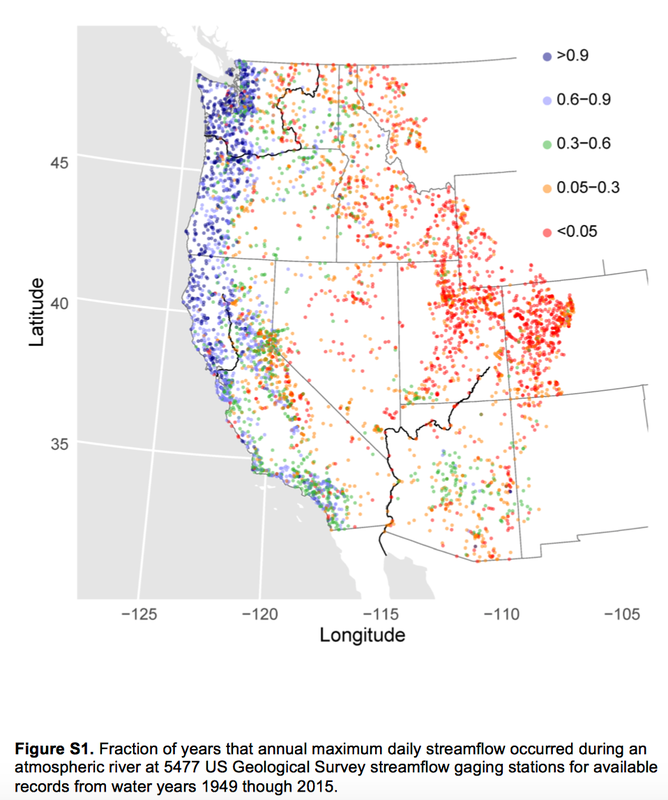 In the study they analyzed historical flood flows at over 5000 streamgages across the western US in relation to landfalling atmospheric-river storms. Specifically, they focused on the probabilities of floods flows occurring as conditioned by the presence of an atmospheric river and by the water vapor-transport rates in the atmospheric river. Through this analysis they were able to show that stronger the atmospheric river, the more likely are flood flows to develop. Along the west coast, these peak flows coincide with atmospheric rivers about 80+% of the time, falling off to about 40-50% of the time in southern California, and falling off the farther inland the river basin (with notable regional anomalies, e.g., around Phoenix and in northern Idaho).